To find out how London Wall Partners can provide independent, professional advice and service around your individual financial situation, please contact the Chief Executive Officer, Nick Fletcher using the contact details below. London Wall Partners LLP is a registered partnership in England and Wales under partnership number OC375373. We are Authorised and Regulated by the Financial Conduct Authority under number 583354. By underground/train: Moorgate (150 yards), Liverpool Street (350 yards), Bank (500 yards), Cannon Street (850 yards), Fenchurch Street (1,230 yards). By the Mayor’s Cycle Hire Scheme: The nearest docking stations for the cycle hire scheme are in Circus Place and in Wormwood Street, close to Liverpool Street Station (noted on the map below). By car: The nearest parking is in Finsbury Circus (EC2M 7AB adjacent to our office) or in the London Wall car park (EC2V 5DY – not shown on map below, but just a short walk away). 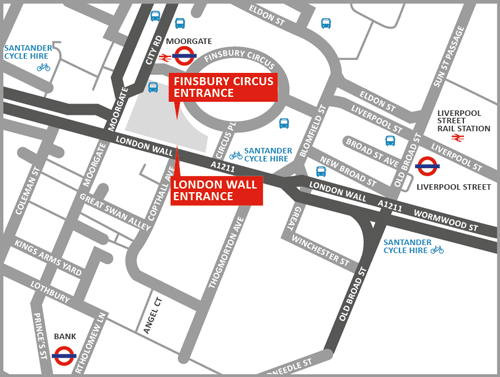 Once at Salisbury House: Our entrance is on London Wall (see “LONDON WALL ENTRANCE” on the map below) in between Boots Opticians and Wasabi (the food shop/restaurant), and directly opposite Copthall Avenue. There are two stone lions above the entrance. Once inside, walk down the short flight of steps to the building’s main reception, who will let us know you are here, and we will come down to meet you.